The new Camozzi Series CGZT grippers with three guided self-centering jaws that enlarge the already broad range dedicated to Handling, represent the perfect combination of performance, reliability and flexibility. The Series CGZT grippers were realized while focusing on design and functionality, optimizing dimensions and weight in order make the product as compact and light as possible, furthermore, thanks to the use of a T-guide, they are able to support, in the three directions of movement, high static and dynamic loads, guaranteeing the right robustness. The use of a high performance and precise force transmission system and the optimization of the thrust areas of the pistons make this type of parallel grippers suitable to provide high gripping forces (from 250 N to over 6200 N) maintaining an extreme repeatability (0,01 mm). Available in 7 sizes, they can be used in different modalities: single-acting, double-acting and double-acting with safety function. This last function is obtained when using the single-acting gripper as a double-acting, assuring that the gripper always remains in an open or closed position in case of absence of air, while retaining the piece. In order to guarantee a high flexibility of mounting on the machine, the body of the gripper has special holes that enable the mounting in two different ways: from above and from below. Air supply can be given on one side or on the bottom. This last feature makes the Series CGZT the ideal solution in applications where the gripper has to be set in rotation (without the use of tubes). 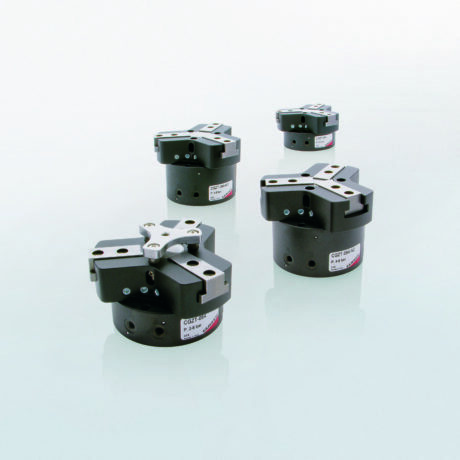 With the gripper, centering bushes are supplied with tolerance h8 which, once positioned on the body and/or on the jaws are able to guarantee, during the assembly or maintenance phase, high precision in positioning and interchangeability of the grippers and of the extensions (0,1 mm). Lightness, robustness, high gripping forces and high resistance to dynamic loads (sudden accelerations) make this type of grippers suitable to be used in combination with anthropomorphic or collaborative robots in pick and place or pick and hold applications and in machine loading and unloading operations in sectors like packaging and material handling and in machine tool processing operations.